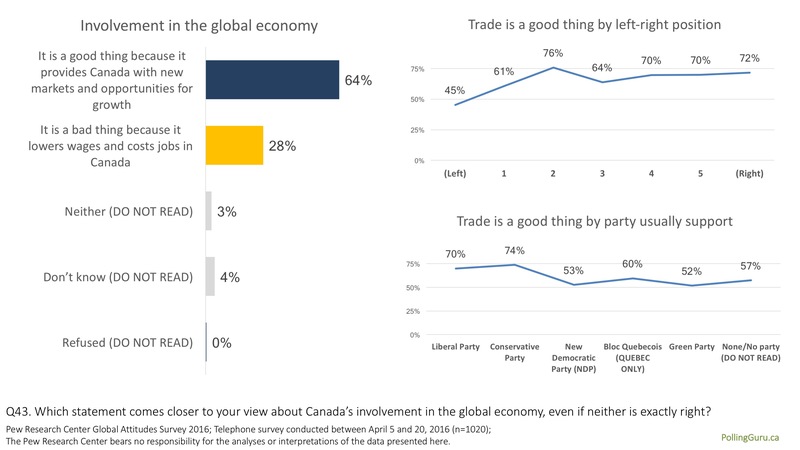 A recent Global Attitudes Survey 2016 by the Pew Research Center provides an interesting window into how Canadians see trade independent of specific agreements or specific trade agreements. Canadians are trade positive, in part because political parties have not sought to capitalize on or build on the one in quarter of Canadians who view international trade as a net negative. Engagement vs Isolationism is a theme that runs through history for most nations. Canada has largely been immune from the strongest form of nation-first nationalism that has often been reflected in the politics of our southern neighbour. Aided, perhaps, by the evolution from our colonial past through to nationhood that was relatively conflict-free. Nevertheless, throughout history there have been protectionist impulses and only recently have we seemingly fully-embraced free trade. In an increasingly interconnected and interdependent world, attitudes about trade are perhaps the best modern bellwether for how isolationist a country’s population wants to be. Is the default, fear and protectionism or opportunity and openness? For Canada the orientation is clearly positive toward trade. 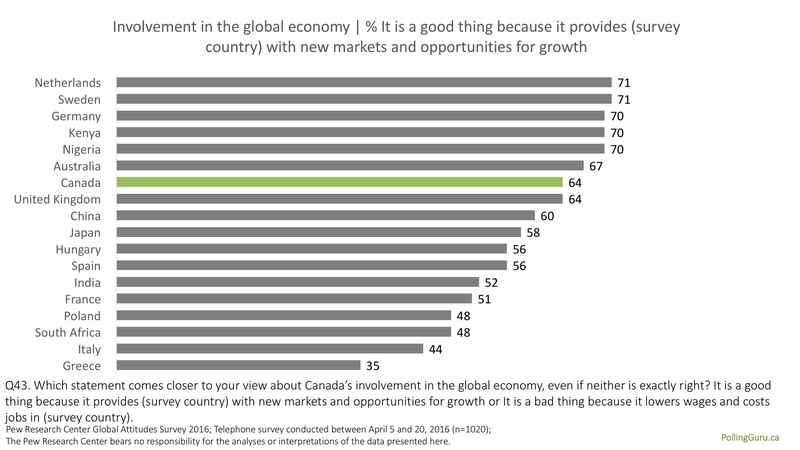 Canadians were asked to position themselves on the question of Canada’s involvement in the global economy in terms of either the positive benefits (new markets and opportunities for growth) or the negative costs (lowers wages and costs jobs). By a significant margin (64% versus 28%), Canadians choose the positive benefits. This is consistent with the historical trend line which saw opposition to trade decrease in the wake of the implementation of the FTA and NAFTA agreements. In the Pew Research Center global comparison, Canada is in the company of Australia and the U.K. in viewing trade through the prism of the benefits of trade. The support for trade as a net positive to the U.K. is striking given the Brexit vote that occurred in June 2016. Not all countries are trade positive with Greece, Italy, South Africa and Poland taking up the least positive in the 18 country comparison. 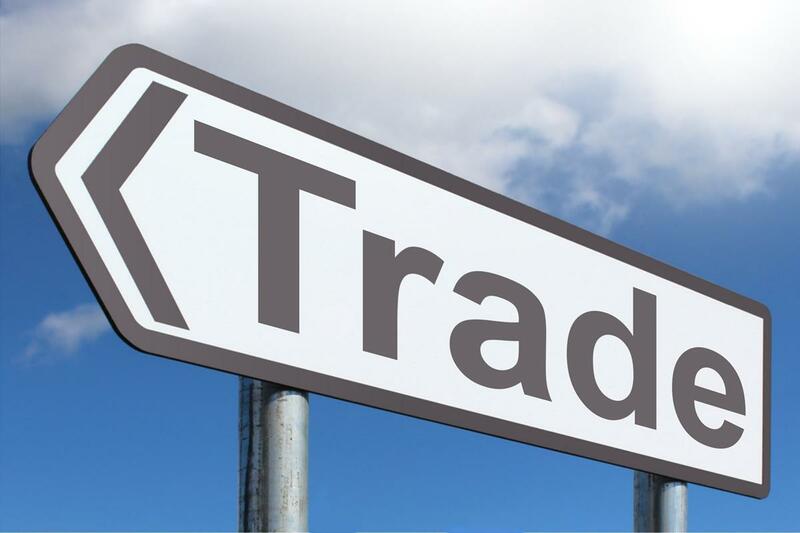 At least one part of the support for trade is likely the lack of anyone seriously opposed to trade. A majority of those who identify on the right and left take the positive position. Even 45% of those who occupy the most left position take a positive trade position. Supporters of the historically largest party are virtually indistinguishable on trade. The most significant risk for a change in attitudes about trade are the political mobilization of disaffected people. While a majority of all demographic groups take the trade-positive view, there are notable differences. Those with less education attainment are less positive. Perceptions of the economy are a strong predictor of holding a positive view. Both younger Canadians and older Canadians are less positive. The Pew Research Center bears no responsibility for the analyses or interpretations of the data presented here.